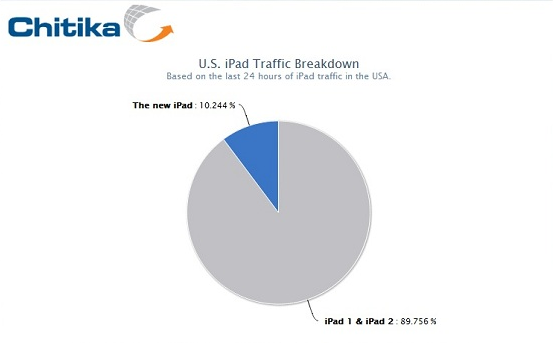 The new iPad just took 3 weeks to conquer a 10% share in the iPad traffic. It’s just been 3 weeks since the third generation of the iPad was launched and the company has already sold out 3 million units in less than four days of release. The tablet, according to Chitika’s real time iPad tracker, was in addition launched in a number of markets. Three weeks is all the time Apple’s new iPad needed to cover a whopping 10% of all the iPad traffic across the network. The new iPad’s share of the iPad traffic peaked at 16.2% on the morning of 8th April and the whole day’s average reached 10% of the traffic share. Chitika’s Gabe Donnini wrote on his company blog, that a 10% of the threshold is much more than an indicator of adoption of the iPad by the people. The new iPad stands a prime example of what a company can hope the results turn out as. The IDC reported that Apple now holds the place of the most dominant tablet manufacturer in the world and with the consumers on the verge of viewing the idea of a tablet as synonymous with an iPad, the chances are quite favorable. Also, a plus point for Apple, their stock price has risen over 100% in the last 12 months.